does IT REALLY MATTER what plates any vehicle is carrying ??? My educated guesses are based on fact that many bikes ride around with no headlights on, because it cost money to fix, and just as many ride with baskets attached to the front, right under the headlights, and once anything is in the basket, headlights are totally blacked out. I have known riders ride without lights "because it saves petrol". I once pointed out to a Thai friend that his back light was out. "I can't see it, I don't need it" was his reply. They don't normally breathalyze their own here so why should a foreigner not get the same benefit of the doubt? Something like 65 people are killed everyday by the poor driving habits of the Thais, making this country justifiably the most dangerous country in the world for road fatalities. Only when a Farang is involved does it get in the news? 60 road deaths a day here in Thailand and 86% of them are from motorbike. I rode here 13 yrs without a scratch until Oct 26 when 59 yo thai lady pulled out in front of me. I am out of pocket 550,000 bhat after 2 surgeries. Police put her at fault. I told her I would take 50% and call it a day. of course she says NO MONEY. I told her give me at least 3000 a month, she said no money. Police yelled at her YOU CAUSED THIS ACCIDENT, you better FIGURE OUT WHAT YOU ARE GOING TO DO, if you go to court and tell judge no money...,, you are going to jail. So you didn't have any insurance then? Did you think you were reading the normal Thai news? Farang accidents are not on the Thai news, they are on the farang news. I was going to comment on this both 'for' and 'against' the Brit & Thai drivers.... because unless we were there or there is any video footage then we have no idea who was actually to blame. HOWEVER, it seems that from the many comments here that people have already said what I was thinking, from both perspectives. I will add 2 other comments though, regardless of there being a higher proportion of Thai drivers on THEIR roads than Farang, I have still personally seen TOO MANY complete idiots to discount the fact that there are also many more poor Thai drivers than good ones. For those that have used the population figures as an excuse, compare that to the UK (similar) or Vietnam (many more) and the actual statistics speak for themselves. Officially or unofficially, over here it has been commented on and stated time after time, what happens behind you is not your fault, Thais look forward, not behind, not to the side but in front - if this were 2 Thais involved I feel there would have been a strong likelihood of the bike being blamed. going too fast, overtaking too close, and not leaving enough distance to manoeuvre or break safely. I'm interested to see if any more 'facts' emerge! Westerners are capable of driving poorly, this is true, though the amount of poor farang drivers is nothing as compared to the locals. I just went to Tesco Lotus and had an idiot stop in front of me smack in the centre of the entrance to the parking area. Absolutely no idea I was behind and trying to park. No idea that stopping there was inconsiderate. Then on the way back, while indicating right, another idiot overtakes at a crazy speed. if I hadn't been checking my mirrors, which many Thais seem to think are unnecessary, he would have taken me out as I made my turn. As it is, I nearly got hit up the arse by the car following me, when I had to hit the brakes to miss the first idiot overtaking. And it is the same every day. The guy in this story was probably howling down the right hand lane, and realised too late there was something ahead. I know just what you are saying TER , a few weeks ago I was turning left into Makro , off of the main highway , an old pick up had overshot the turning so it started to reverse , I blew the horn in order to tell the driver I was turning and didn't need to be run in to. All the way round Makro I was getting the evil eye from the driver , my TW thought a problem was coming. Ok Tesco 2 days ago , I stopped for a coffee at the Donut place near the entrance , a women was in there having a drink . someone she knew was a about to go through the doors saw her friend LEFT her cart in the middle of the exit to come over for a chat , folk were using the other door or steering their cart round the abandoned one ! 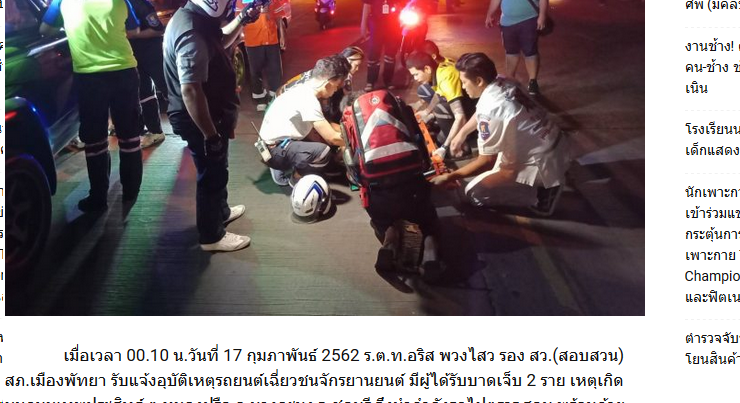 "Chalermphon said he was heading for Sukhumvit Road when the car made a sudden and unexpected U-turn. He was unable to brake in time and hit the rear right side at speed." He didn't say anything about the car pulling across in front of him. Going on what the motorbike driver said, we can only assume he was following the car too closely, not allowing enough distance between himself and the car in front of him. Perhaps the bike was following the car in the turn lane to make a right turn, assumed the car was turning right as well and tried to overtake him while crossing the road. Bike's fault. Or the motorbike was going down the wrong side of the road when the car did a u-turn. Bike's fault. Or the car had completed the u-turn and was merging into traffic and the bike hit him. Probably bike's fault (for not letting the car merge). I can't think of a scenario where the car would be 100% at fault and the bike finishes up hitting the right rear of the car. If the car were 100% at fault, the damage would most likely be on the left side of the car. That could just mean he tried to cross the lanes of oncoming traffic quickly, as you should, rather than slowly creeping out into oncoming traffic until someone finally stops to let you go (the "safe" way that many Thais do it). Looks to be Thai news. It adds to the word count of the article. In Britain even the stupid/ignorant etc. in addition to the rest of the population who drive have passed a test which requires safe driving. The probability of the Brit being 'in the wrong ' is very low. The Pattaya News is published in both English and Thai, that does not make it "the Thai news", it was founded a few years ago by expats, markets to expats and reports expat news, its an expat paper. I see Alex Alborn (Thailand's budding F1 driver) managed to stay on the track for just 4 corners before spinning off during testing today.